Talks about the continuing of the National Government, and Cabinet reshuffles in the offing has caused much perplexity and a confusion about the direction of the Government. During the heat of the election campaign President was clearly heard ascertaining that he would not continue to govern with corrupt elements. Several other spokesmen on behalf of the SLFP and UPFA announced qualifying it further that they plan to form a government of their own which was clearly understood as parting of ways with the UNP. The election result with the new born SLPP leading to a clean sweep in the Local Government bodies, has apparently awaken both President and Prime Minister from their slumber and forced them to face the reality. While both of them were not seriously interested in continuing a Unity government the result of the LG elections have compelled them to realign their individual plans much to their own dislike. So it appears that hurriedly worked out makeshift solutions are put into place without much pondering over the possible adverse consequences on the one hand and without putting on the thinking caps to decide on more palatable solutions without falling into pitfalls. This is more important to the President’s wing since the UNP standing on its own has suffered the most ignominious defeat. There appears to be some fishing in troubled waters on the part of the UNP exactly similar to what they hurriedly accomplished during the 100 days government in constitutionalizing several restraints on the incumbent President. Due to this hurried operation to hang on to power in the middle of growing Public demand and pressure for the removal or resignation of Prime Minister Wickremesinghe many opportunities available for safer and saner decision making will be blocked. And it is another display of mastermind tactics to go the way UNP wants by bill and coo actions. A cabinet reshuffle is a façade to stop the President from using his powers under the constitution to completely change the assignment of subjects and functions and the composition of the cabinet of Ministers available to him under article 43(3). If the President chooses to exercise this power then the current cabinet in its entirety will stand dissolved. Then when this happens according to Article 46(2) the office of the PM will fall vacant because PM continues to hold office only when the cabinet of Ministers continue. But due to the UNP red herring the President will be prevented from exercising his powers. It is the President according to our constitution who can decide on the subjects, functions and composition of Ministers. He was publicly heard stating that the management of the economy which was under the UNP wing was unsatisfactory. One reason for this may be the shamble that the UNP created in the Ministry of Finance by dividing that into 5 ministries.The people may not be so much interested in UPFA doing it alone but they certainly are interested in a system of cabinet with functions correlated cohesively to be in place. It is a pity that this opportunity is lost to the President. There is no dispute to the fact that it is the PM whoever is selected who will select the individual MPs for the various portfolios and advice the President according to Article 44(1) of the constitution. Hence in the present context this cabinet reshuffle is a hoax to reappoint those who have been up to questionable deals and wanting in proper performance standards and competences. We respectfully call upon the President to view this matter seriously. The UNP no doubt played a dynamic front line role in electing the President. No one who associated with that will want UNP out as a party from the coalition government. But people as well as the Party will need a change in the Party leadership or at least in the Premiership for obvious proven reasons. The Party appears to be slogging looking for somebody to bell the cat although there is no division of opinion among them regarding the issue. They must look at things more realistically. There is what is called a constitution. And according to it there cannot be early elections before the Parliament is dissolved according to the provisions under article 70. Perhaps professor GL has not seen it! So as the only other alternative possible to see whether they can succeed is for someone who came to parliament under UPFA now belonging to Pohottuwa bring a private motion to parliament seeking its dissolution. If it succeeds god will save the king! Otherwise GL will have to show how he intends to get the parliament dissolved without hood winking the public. Some MPs want Mr. Mahinda Rajapaksa to be made the leader of opposition. As this idea is coming after the victory of pohottuwa it can be construed that they are also asking for the recognition of SLPP in the parliament. For that to happen Mr Rajapaksa and many others will have to forego their parliamentary seats to which they got elected under UPFA. How deceptive? Death is there in the English and not in the Sinhala. Removal is there in the Sinhala and not in the English. Those who drafted or crafted will have to explain why and how this has happened. One of the cardinal roles of the Judiciary is to apply uniform interpretation and implementation of the Law. They have to guide in the event of controversies. Hope this will be addressed by the judiciary. What ever is said about it the country is in a dilemma. Those responsible for it should not be allowed to find a way out. The President we believe will carefully consider all related issues and take a decision. Because it is his government. Governments in this country are referred to as governments of the Presidents in power. No one calls it Ranil Wickremesinghe’s Government. Nor did they call it Premadasa Government when JR was the President. 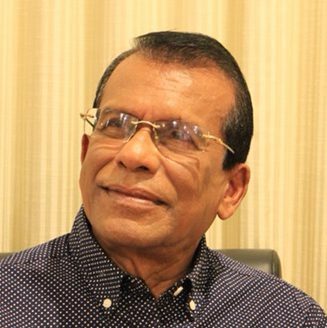 Therefore President Maithripala Sirisena, who was elected by the overall majority of the people of this country should take it upon himself and no one else in order to take the country out of the mess it is now. The most prudent step is to prorogue the parliament, decide on a new cabinet with functions clearly defined in keeping with good governance principles, appoint a PM preferably from the UNP as it was the party that helped most in bringing about the change, if seniority or protocol is applicable next to the PM is the Speaker in the Order, and get the new PM to advice who the members of the cabinet are and carry on the government. The whole world will no doubt acknowledge this as the best course of democratic action. Those who are fighting for status quo are doing so only because they have vested interests and are sitting on cans of worms. They may not be taken seriously. Rusiripala Tennakoon says “May we point out that whatever is contained in Tamil or English according to Law the Sinhala prevails”. Please refer to the 16th Amendment to the Constitution enacted in the year 1988.
,it deals with Language of administration,Language of Courts and language of legislation. Language of administration in the seven provinces is Sinhala whereas the Language of administration in the Northern and Eastern provinces is Tamil. Similar provisions for language of courts. Regarding legislation, the 16A provides that all laws and subordinate legislation have to be enacted in Sinhala and Tamil with English translation. .This means that Sinhala and Tamil versions are the originals. However Parliament at the stage of enactment determine which language prevails. That is why in all Acts, it is mentioned that in the event of any inconsistency between the texts,Sinhala version prevails, it should be noted that legally it is permissible to say that Tamil version prevails. In the Northern and Eastern Provincial Councils statutes are presented in Sinhala and Tamil,but it is mentioned in the statute itself that in the event of any inconsistency the Tamil version prevails. 16 a is a vey progressive piece of legislation that has solved the language question to the satisfaction of all concerned. After over seventy years of messy life we now accept we are in a mess. To get out of the mess, we must address the cause of this mess. Was it the language/religion-divide? At the LC elections, SLPP made this the issue. Will other parties copy this? As we spiral down, our Transparency International Corruption Index goes up! When do we start thinking about this? Do you propose worser chaos? Give the elements a chance now to correct. If not educated people will decide their fate in 2020. If the leaders are hoenst and respectable. This would not have been gopne for over three years. they both got caught. There are other thing sthat are not discussed because of this. Simply why they cannot release the COLI report. All suggestions work for honest politicians who have self respect and does not want to be naked. these people are uneducated, dishonest and Naked to the best of their ability. What you say about the 19A is correct., but it is not always true.It is true only because 19A says so. It is not always so. .If the particular Act or constitutional amendment says that in the event of inconsistency the Tamil version prevails, then it is the Tamil version. I challenge the word “always” in your article.It is not so! It has nothing to do with any supremacy issue,it is simply correct interpretation of the constitution as it is after the 16A. Instead of knit picking why not allow the Supreme court to decide on this issue? He is hell bent on chasing ranil with killi maharajas instructions. Where did you find this word “always” in my article? ?